world war I | Cry Havoc and Let Slip the Dogs of War! 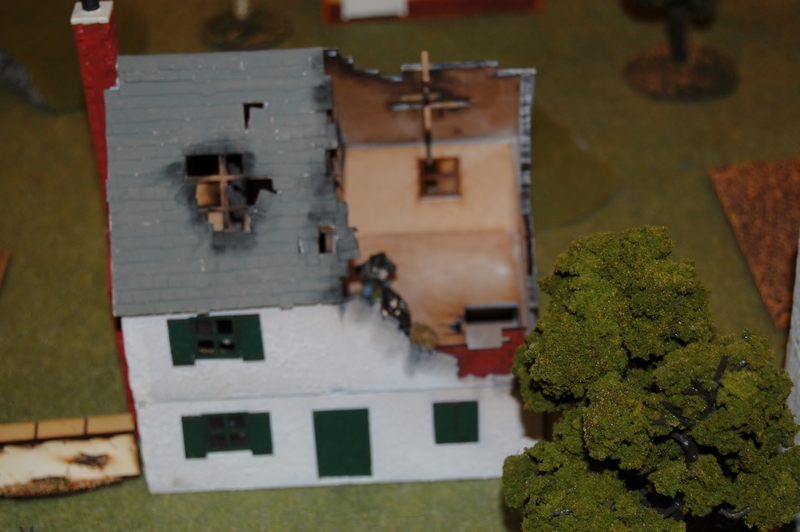 August 20-23 marked the return of local wargaming convention, Guns of August. This local show is one of two put on by ODMS here in Williamsburg every year. Usually there are about 200 people in Attendence and soon the venue will be changing to allow for continued growth. I was slated to run a Sharp Practice game on Friday night, but had to cancel due to difficulties getting home from New Hampshire on a work related trip. While that game didn’t happen I did take the time to run a add on Chain of Command game Saturday afternoon. My players were two old friends of mine, Alfred and Malcolm. Alfred decided to play Germans and so Malcolm took command of the French. The French suffered a bit from their patrol phase. One challenge to Chain of Command is the learning curve attached to the patrol phase. This phase represents the pre-battle reconnaissance of the forces involved but it is a game unto itself. it is also pretty much exclusively a Too Fat Lardies concept and therefore unfamiliar to most players. Very often it will take a players few games to understand the importance of the phase and how to use it tactically. this does give an advantage to the player more familiar with the ruleset. I think at conventions I need to get more proactive in helping new players through this bit. the French therefore found themselves with most of their jump off markers trapped rater close together and far back, behind a stone wall to the rear of the table. one was forward in the central farmhouse. The French did take the very strong defensive position in that central farmhouse. A German squad aggressively approached it to just out of Close combat range. Their Junior Leader ordered two potato mashers lobbed into the house, but they missed the window and skitted of harmlessly. Well almost harmlessly. Oddly enough this aggression seemed to frighten the Poilus inside and the immediately were ordered to retreat and fall back to the cover of the stone wall that ran parallel the length of the southern table edge. this action proved disastrous, as it meant crossing an open area in cross fire to get to that cover. The Frenchmen took serious casualties and their eventually broke and fled, causing serious loss to the French Force Morale, not to mention represent a third of their force already gone. After this point the French settled into a static defense of the rear wall and the game turned into a long drawn out exchange of small fire. Never the best course of action in a Chain of Command game and certainly not one when opposing a larger force also in defensive positions. 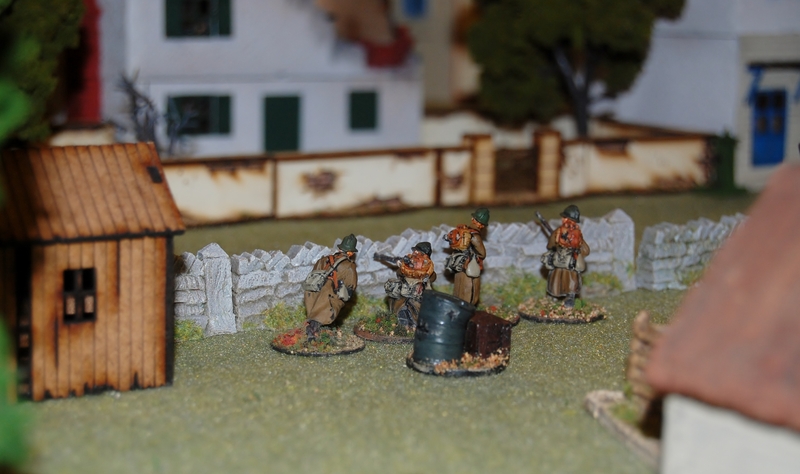 Either from confusion or unlucky command dice rolls, the French command was slow to deploy his brigaded Rifle Grenades which can be devastatingly useful. The Germans never deployed their Panzer II, and because of that the French also waited to deploy their AT gun, which may have proven helpful against the infantry onslaught as well. Eventually attrition did it’s bit. The French position slowly collapsed due to casualties, shock, and dwindling Force Morale. Just in the nick of time for me OI might add, as I was scheduled to run the Battle for Lake Tanganyika directly thereafter! This was the second time I ran this battle, but this was the reason it was created. My club, The Williamsburg Legati, are commemorating the 100 year anniversary of World War One by sponsoring themed games at both Williamsburg Muster and Guns of August over the next few years. Some of these are the major actions and other, like this one, or more unusual situations. This battle was actually made up of a few encounters fought between December of 1915 and February of 1916 on the world’s second largest and second deepest freshwater lake in the world. involving elements of the British Royal Navy, Belgian Congo’s Force Publique, and Imperial Germany’s Kaiserlich Marine. Basically, the Germans held complete naval superiority of the lake this with small ship and a couple of boats. The British decided to challenge this by transporting two 30 foot motor boats through the Congo. A crazy and arduous adventure on its own. Command for this mission was given to an eccentric British Naval administrator Geoffrey Spicer Simpson. For the game I combined what were in reality two separate actions, to allow the Germans the use of both their boats instead of letting the British attack them piecemeal as happened in reality. 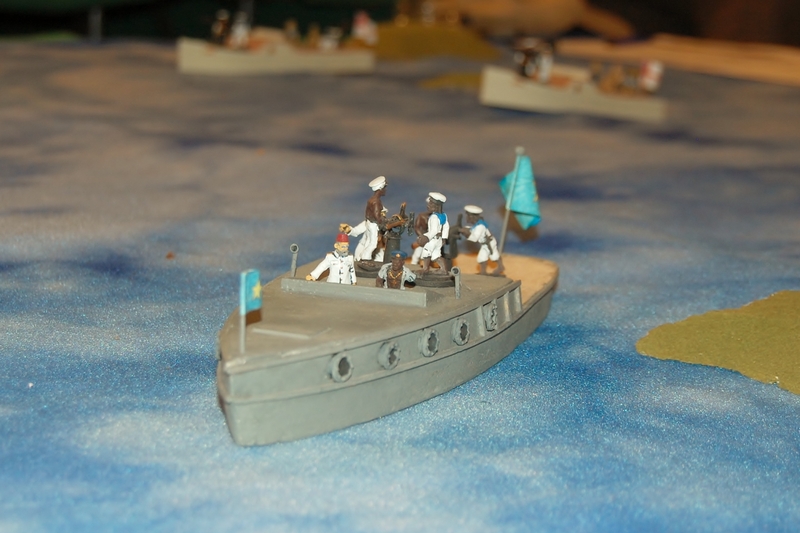 The game was played in 28mm with most of the vessels built by myself with the exception of the British vessels the Mimi and the Toutou. These are Old Glory castings. the rules used were TVAGs Boilers and Breechloaders. A little bit of adjustment had to be made for the two British ships (which are both petrol boats not covered by the period or rules). The vessels are also over armed by the rules,, but I followed the history. That might have been an error. Having run this twice I am pretty sure that the points are not equal, giving far to strong an advantage to the British/ Belgian coalition. If I ever do this again I will need to make some changes. Boilers and Breechloaders is a card driven activation system. this proved disastrous for the Germans. Over and over again they were losing initiative to the Brits. Besides that factor, the Kingani’s captain had horrible dice luck. he was successfully avoiding any critical damage but is shots kept missing their target, and his 6 pounder was the largest of the German guns. Furthermore an incredibly lucky British first shot left hedwig’s main gun crew disabled! Damage was being done to the British boats. One more hit on either would have seen them destroyed, but the Germans lost the ability to strike. Kingani was taking on water, her speed reduced and constant machine gun fire eventually left the Hedwig bereft of her crew. I like to report that all players had a good time, but not on this occasion. At least one of the Germans was displeased. I do think this game has some balancing issues, which I had warned when I begun, but it really was more luck that hurt the Germans than anything else. I may run this on one more occasion, or maybe not. The theme for Williamsburg Muster is Naval and the second battle did happen in February 1916 (Muster is in February). if I do, I will either use different rules, modified rules or leave the Belgian ships out.